The Programme covered progress on SOPA’S Campaign Actions and other work by older people’s organisations. 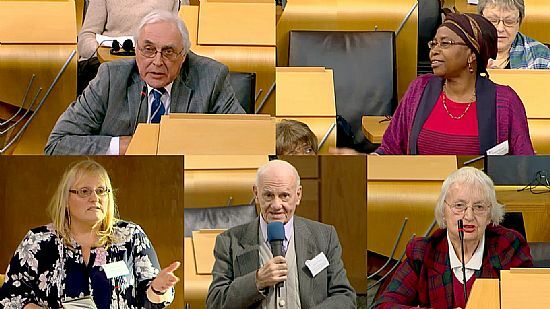 The Assembly attracted MSPs holding key positions on older people’s and equality issues who addressed the Assembly and responded to questions and comments. 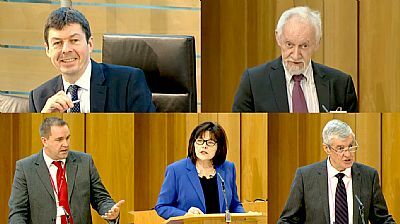 The event was broadcast live from the parliament and the webcasts of the morning and afternoon sessions can be viewed online. See below. Top: Rt Hon Ken Macintosh MSP, Presiding Officer and Assembly Chair, Tom Berney, Chair SOPA - Campaign Issues. Below: Neil Findlay MSP, Convener, Scottish Parliament Health & Sport Committee, Jeane Freeman OBE MSP, Minister for Social Security, John McCormick, Chair, Commission on Parliamentary Reform. 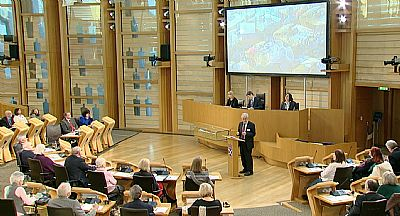 Following a warm welcome from the Presiding Officer, Tom Berney, SOPA Chair, gave an overview of the year's achievements (see background film below). He was followed by Neil Findlay MSP who described the strategic plan of the Health and Sport Committee to improve people's health through the reduction of inequalities by encouraging preventions. The Committee is planning to monitor the progress of integrated joint boards, situations of 'bed-blocking', home support efficacy and staff shortages, including recruiting GPs. 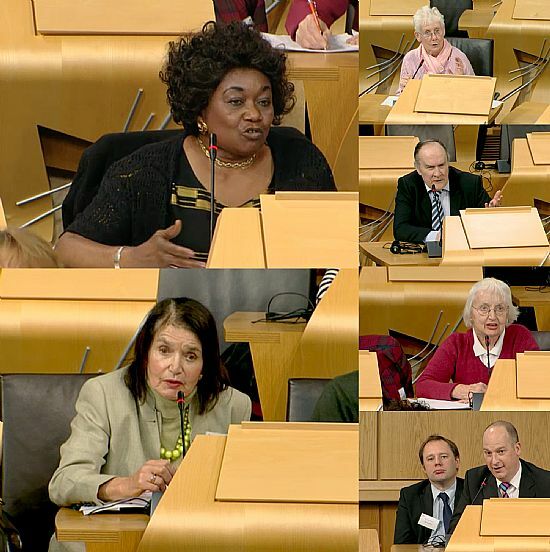 The Minister for Social Security Jeane Freeman OBE invited SOPA, together with other organisations which receive money from the Equality Fund, to meet with her in February 2017 at Holyrood to advance older people’s rights. "Soon we will start our recruitment drive for 2000 volunteers of all ages to join our Experience Panels - people to work with us to design, build and test our new social security system, making sure that we really do have the principles of dignity and respect threaded through everything we do and every decision we make." Chair of the Commission on Parliamentary Reform John McCormick described the Commission's remit to consider ways in which the Parliament has the right checks and balances in place and increases its engagement with wider society. He invited people to attend open meetings or complete an online survey. 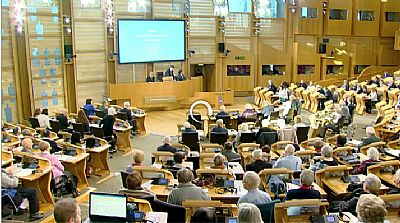 The 2016 Scottish Older People's Assembly was streamed live from the debating chamber of the parliament. Click left to access the (morning) recording. The older people's groups started speaking at 1 hr 20 min. into proceedings. Drag slider of video player to this point to view this 30 minute section. 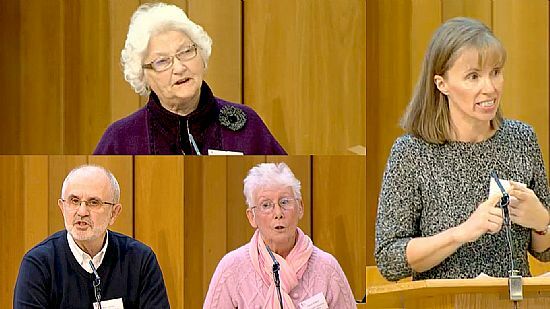 These speakers presented brief overviews of their organisations' activities over the past year and ways they are engaging with the older population at local level, providing examples of good practice. Top - Diana Findlay, Scottish Borders Seniors Networking Forum and Age Scotland. Rt - Alison Clyde, Generations Working Together: Below - Alan Spinks, National Federation of Occupational Pensioners: Eileen Wallace, Stirling Reference Working Group for Older People. 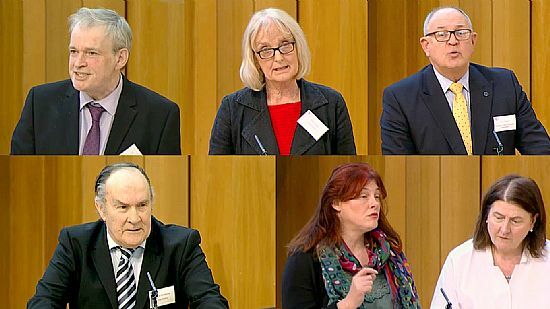 Top - Donald Macleod, Highland Senior Citizens Network: Kath Payne, U3A Scotland: John Parkhill, Learning in Later Life Students’ Association, Strathclyde University: Below - Rob Snodgrass, Grey Matters, Argyll and Bute: Helena Scott and Angela Dias, Scottish Mental Health Cooperative. Searching questions from delegates and appeals for action. See 2016 December Newsletter for more detail. Watch the afternoon session by clicking the parliament image. 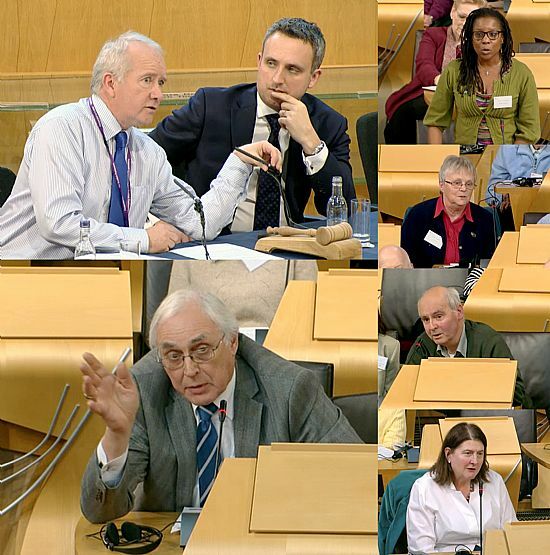 Presentations from Alex Cole-Hamilton MSP (Photo below: top left in the suit) and David Callum (beside him), Clerk to the Scottish Government Health and Sports Committee. Followed by Q&A session. See 2016 December Newsletter for more detail. In 2012 the SOPA Assembly agreed a vote of no confidence in the Care Inspectorate. 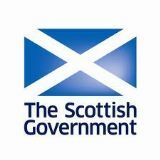 A revised set of standards is now available for consultation at the Scottish Government website New Health and Social Care Standards Review. 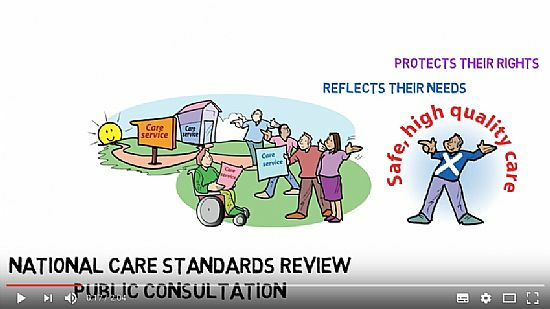 These are quite different and based on people's experience of care in a range of health and social care settings. 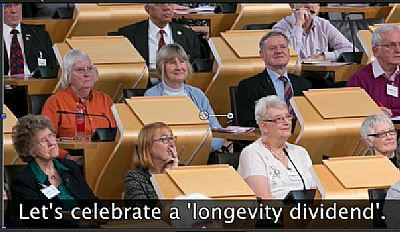 More information on 2 minute animation ScotGov YouTube film below.